A buttset is the basic tool of the trade for anyone working on phonelines and is an essential tool to have in your toolbox. 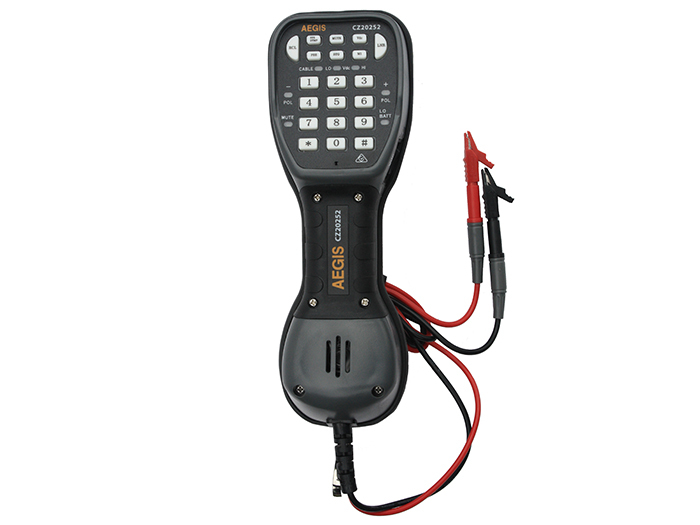 The Aegis range of test telephones (buttsets) are designed for use on phone systems by line installers, repair technicians, and other tradespeople for phone line testing and monitoring. There is a model suitable for every application, from basic to advanced, meaning you can choose the buttset that is right for you. The CZ20252 is the latest release by Aegis providing voice, data, and video technicians/engineers all the functionality essential in a test set. This model builds on the CZ20018 by adding features that make everyday use a pleasure such as 2 way hands free operation, Voltage indication for hazard identification, and being QuickSwitch ready, meaning you can to interfaces such as Krone, Quante/3M, Madison, Siemens, Marconi, and more through the Aegis QuickSwitch system. Being IP54 makes it a truly rugged and robust test phone that will last in your work environment.